*This post was previously published last year, but since everyone including me has forgotten what I wrote last year on teacher appreciation, I am running this again. The first full week of May is set aside for Teacher Appreciation Week. I love this week because this usually means that I will be fed multiple times during the week by the PTSO, and I love to eat. While I am touched by the efforts that parents take to make sure teachers feel appreciated this week, I want to tell you the best way to show your appreciation to a teacher. Raise your child to be respectful of authority and not make a sound like a tire leaking air when asked to do something. Raise your child to know what hard work is. Raise your child to know that education is not only a right but a privilege. Quit making excuses for your child. Children make mistakes creating valuable opportunities to learn life lessons. Parents who rush in too quickly to excuse behavior generally end up raising brats. And brats are brats. Make sure your child knows the difference between being smart and being a smart – well, you get it. Along with the brats, these kids make for long days. Don’t be quick to judge. Some things you hear about what goes on in the room are true, but many aren’t or are exaggerated. Remember also that I hear all about what goes on in your home as well. Pray for me. I need it as I am in a building with almost 2,000 teenagers everyday. A student asking me on Monday how my weekend was. (He may be fishing to see what lame activities old women engage in during the weekend, but I find it endearing). A student who tries to quiet the class while I am talking. Receiving invitations to graduation parties. A student opening the door for me when my hands are full. A student staying after school to help me clean my room (disregard the fact the we were looking for her essay). A student who draws a picture for me at the bottom of every essay. 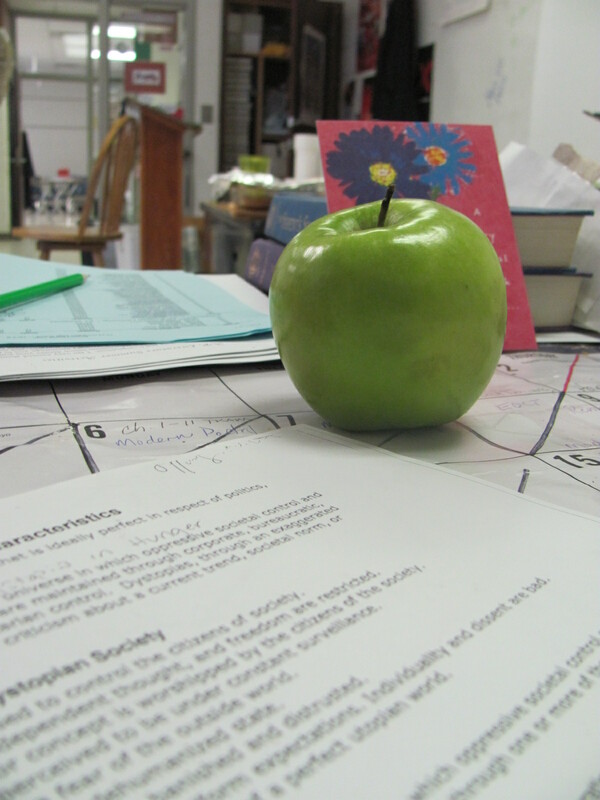 A random, non-poisonous apple appearing on my desk. An email from a parent – not during teacher appreciation week – telling me that I have influenced her child. A $50 Starbucks card appearing next to the apple. Okay, time to wrap up the blog as my fantasy world and reality are beginning to collide. This week is a great week to celebrate teachers but know that what you as a parent do all year, making daily decisions to raise good students, goes further than a week of meals (unless it’s the double chocolate cake with raspberry sauce). Keep up your good work and share this Kid President video with your favorite teacher.